Obviously, we love eating out and at the moment there seems to be a bit of a surge in fantastic new restaurants opening in Newcastle. 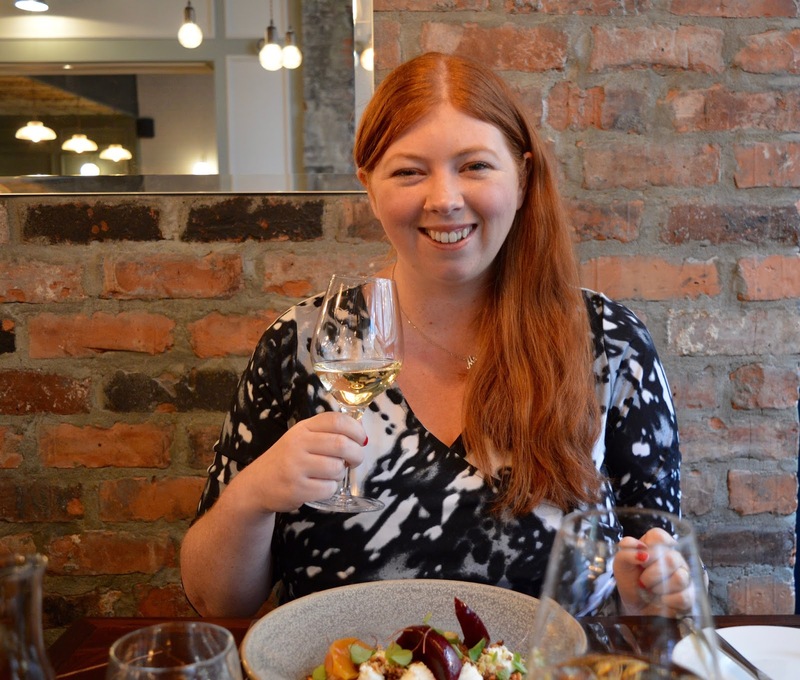 I'm not one for writing positive reviews where they're not due (see here) and I know as a blogger, I am very privileged to receive invites to review many of these new eateries. I really love my food and think that life is far too short to be eating crap food, even if it is 'free'. So now I only tend to say yes to the invites that offer something new to Newcastle or somewhere I think the kids will enjoy. One such invite was Dobson & Parnell. 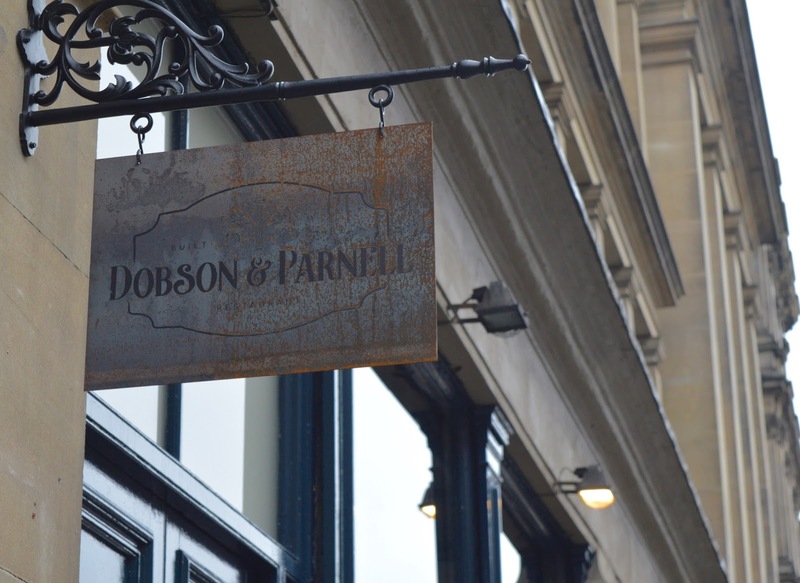 Dobson & Parnell is ideally located on Queen Street near the Tyne Bridge on Newcastle's Quayside. Next door to the Great British Cupcakery and Vujon, the entrance is understated and kind of hidden which hints at the secret Gentleman's Club vibe that the restaurant has going on. Brought to you by the team behind two of my favourite restaurants, Blackfriars and Hinnies, I couldn't wait to see how Dobson & Parnell would compare. 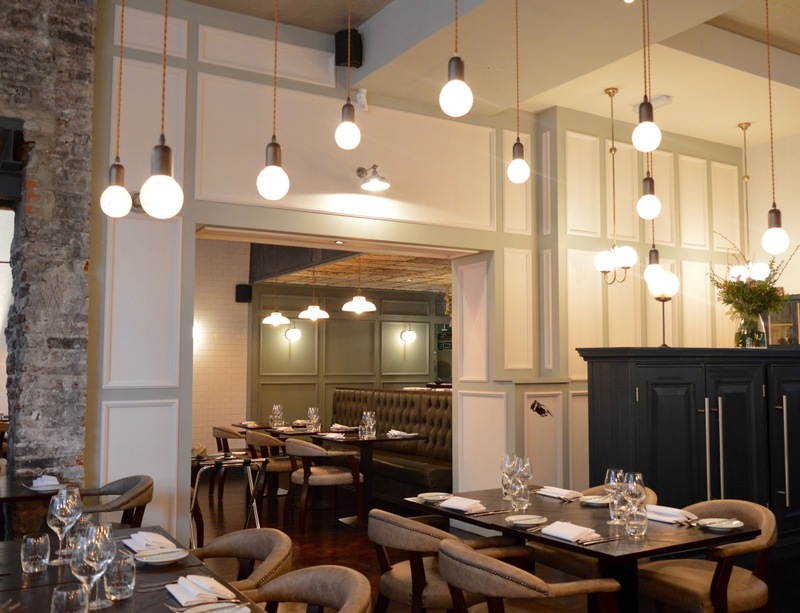 The interior has a very classic feel to it but with a modern twist so it doesn't feel too stuffy - classical music playing in the background sets the ambience and dark leather booths and 'proper' bound menus sit alongside exposed bricks and naked light bulbs. It's a combination that works well. The staff are suited and booted and the service is as polished as their shoes. The atmosphere does feel fairly upmarket but there is absolutely no pomposity at all. 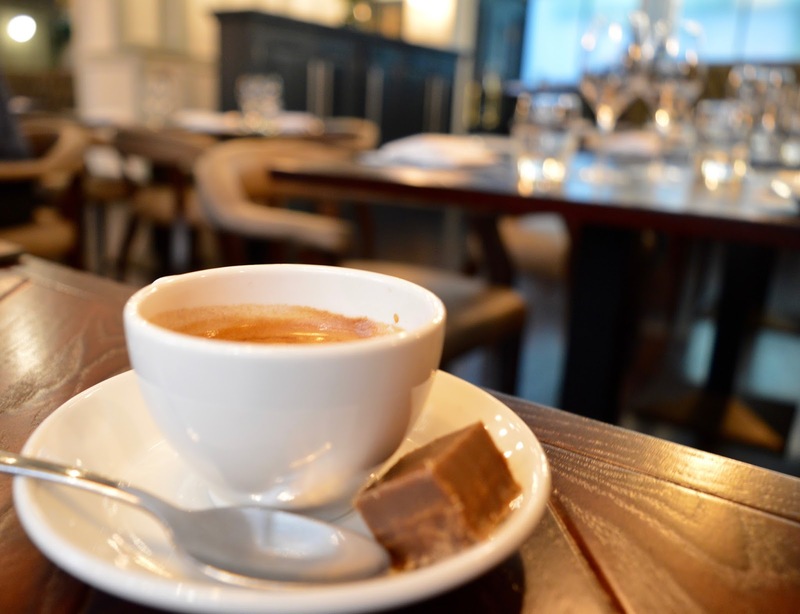 The staff are attentive, knowledgeable and are all foodies themselves and the front of house team are more than happy to offer recommendations, have a bit of relaxed banter with you and will provide you little insights into the food you are served (eg where it's sourced). I would say the whole feel of the place is somewhere between Blackfriars and Jesmond Dene House. 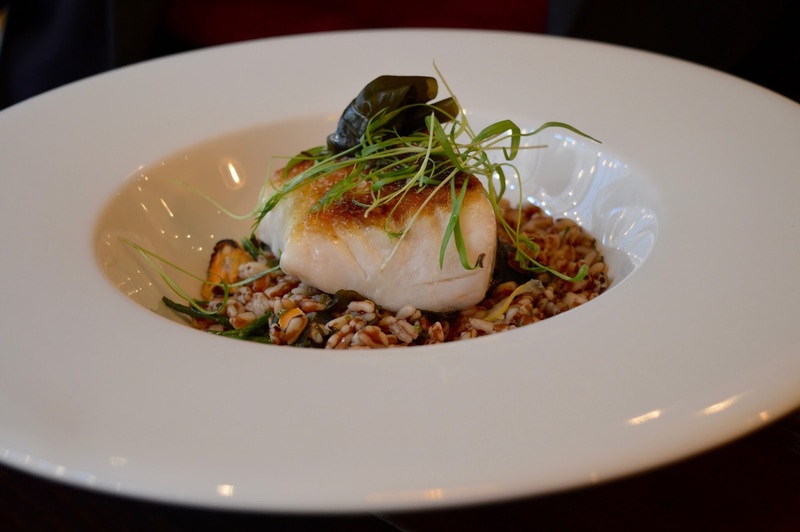 Onto the food.......Dobson & Parnell offer a Daily Set Menu, A La Carte and Sunday Lunch. A Tasting Menu is coming soon. The only time we dine a la carte is on a special occasion (if only we had the budget to do this more often) so we decided to opt for the daily set menu. 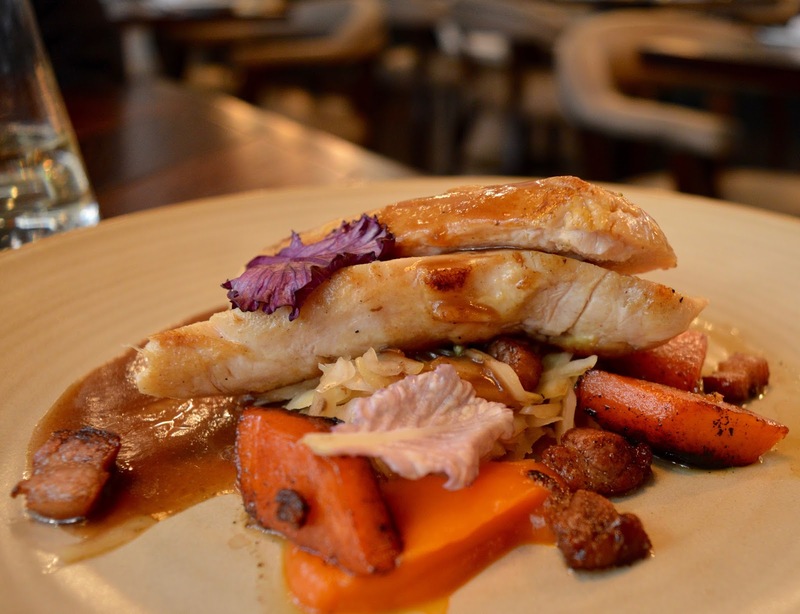 This menu changes every couple of days and has a strong focus on seasonal produce. Priced from £17 for 2 courses at lunch up to £30 for a 3 course business lunch including wine, water and coffee, we went for the latter option as decided it offered better value. A little note about pricing if I may - £30 for 3 courses of high quality, local food with wine, coffee & water is superb value. For comparison - mozzarella & tomato salad followed by beef pie and cheesecake with a glass of Sauvignon Blanc and coffee will set you back £28.50 at the Slug & Lettuce across the road. Hmmm now I know where I'd rather spend my cash. I went for the Goats Cheese and Beetroot - a tried and tested combo I know but it's one I love. 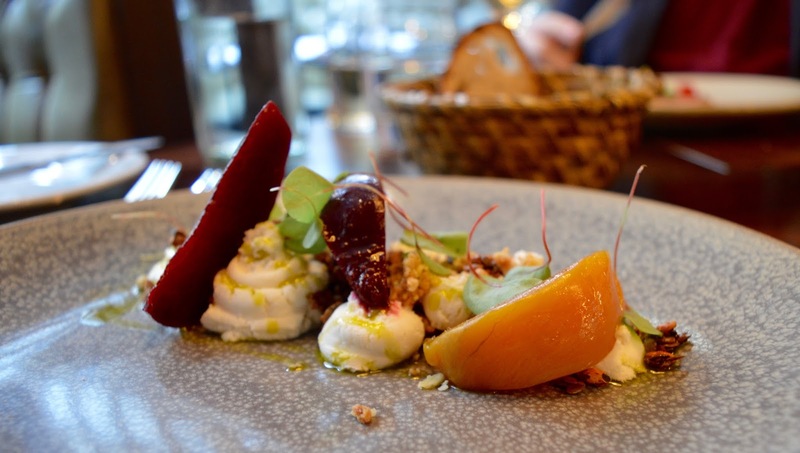 This version was elevated with two different types of Beetroot (the orange one being quite rare - I didn't catch the exact name) and the addition of spiced granola. 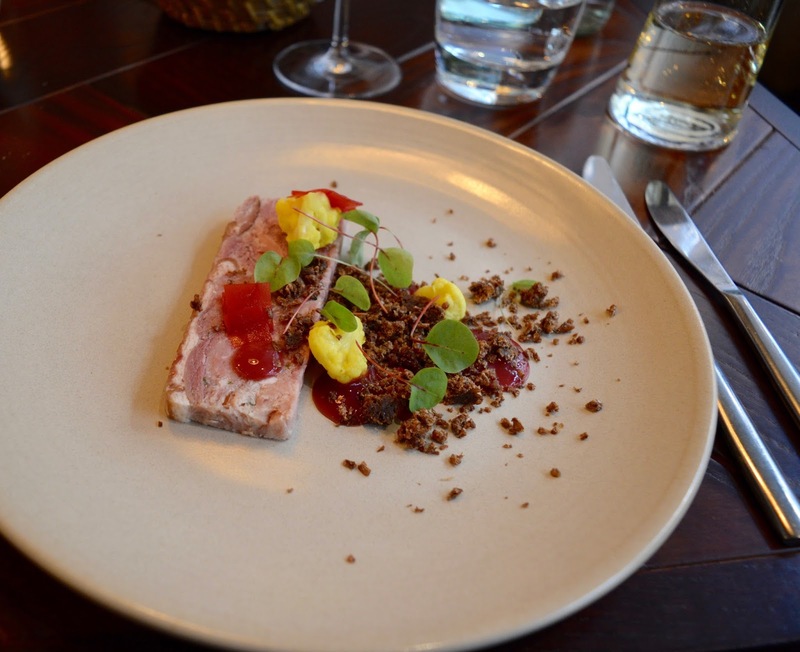 I adored this dish - the granola really transformed it into something else. My only criticism would be that the cheese to beetroot ratio wasn't quite right and I ended up eating forkfuls of cheese with no beetroot. Not that this is a serious criticism mind - who doesn't love forkfuls of cheese? One extra piece of beetroot and this dish would have been perfect. As you can see by Steve's smiley face - he is in pure food heaven and loved his terrine. I didn't try it myself (I'm not a terrine kind of girl) but he was full of praise for the dish. Onto our mains and we both decided this was our favourite course. I went with the chicken and this version was far from bland and actually properly tasted of chicken which I know may sound weird to say but often I find chicken has very little flavour. The chicken gravy and heritage carrots were just so moreish and although Steve is a very good cook, there's no way he could recreate the flavours in this dish for me at home. It's simple but there has obviously been a lot of time and effort put into creating a dish this good. Steve was equally as pleased with his cod and couldn't get enough of the smoked mussels it was served with. I was shocked to discover that cheese is included as a dessert alternative on the set menu at no additional cost - I can't remember the last time we visited somewhere that didn't charge a supplement for cheese. 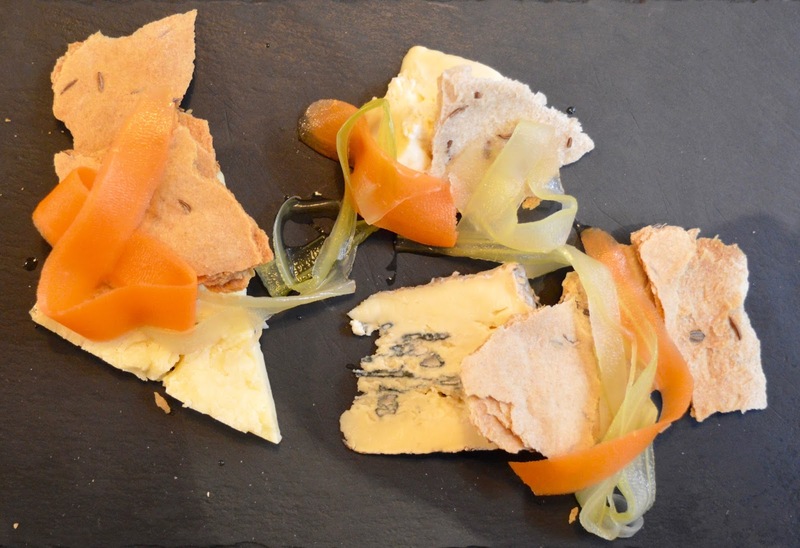 If you remember our cheese board over Christmas, you'll know how much we love our cheese. We tend to order one dessert and one portion of cheese and share both (top tip to make your meal go further here - haha). The cheeses here were spot on with the blue cheese being Steve's favourite whilst I preferred the goats (as if I hadn't had enough with my starter). 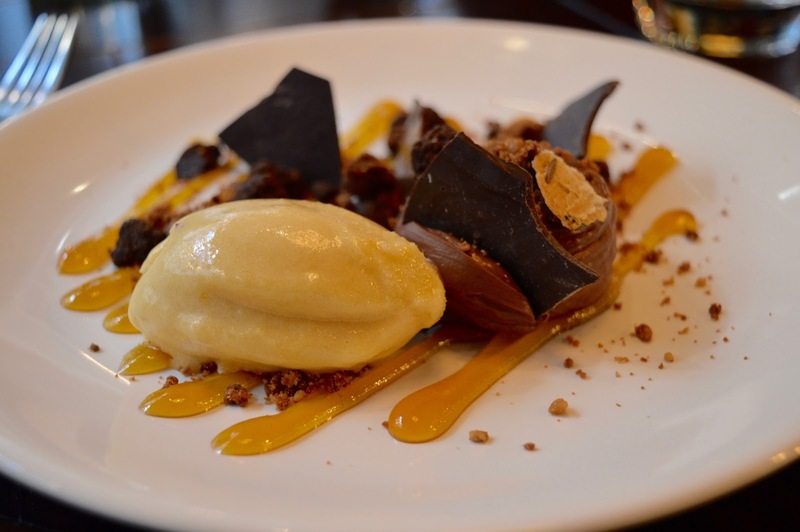 My dessert was incredible - I don't think I've ever tried passionfruit and chocolate together and if you haven't either, I'd recommend trying it - the flavours were again stunning and there is certainly nothing bland and boring about the food served at Dobson & Parnell. The portions were pretty good (enough for us to share) and we didn't feel out of place digging in with two spoons. We ended our meal relaxing with a (very good) Espresso which was served with homemade fudge. Perfect. Dobson and Parnell isn't the sort of place I would just pop into for a light lunch, it's more special than that. 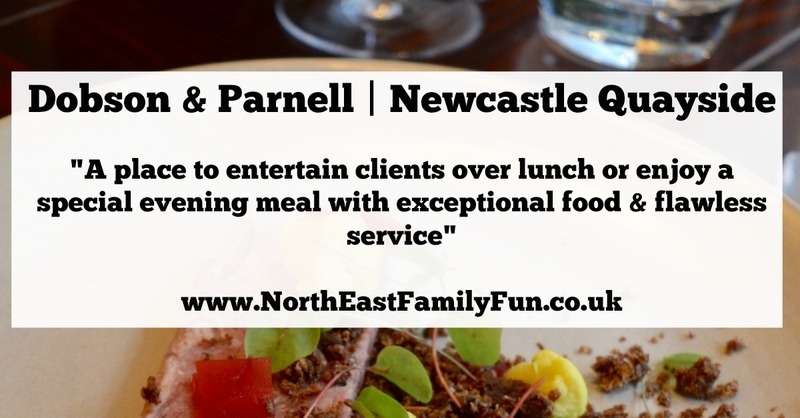 I would definitely recommend their business lunch if you are looking for somewhere to entertain clients or meet a colleague for lunch. It's also the sort of place I would recommend as a place to take your best friend for a long birthday lunch. 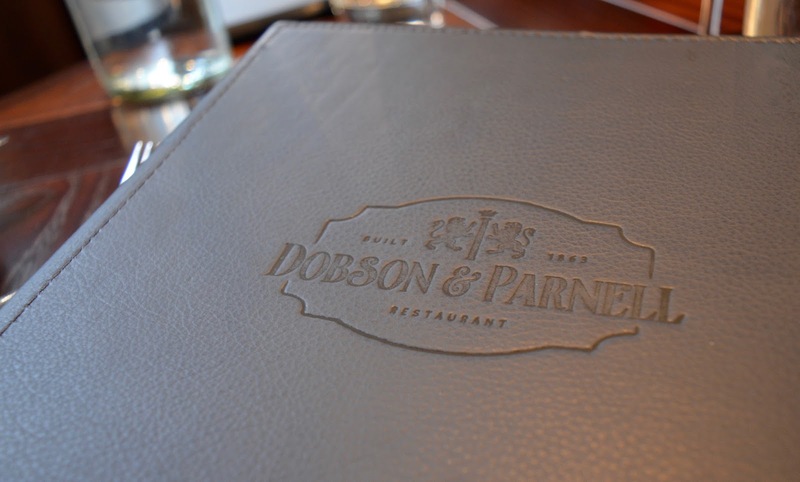 Equally, if you're looking for a special venue for date night with a little old school glamour and elegance, Dobson & Parnell won't let you down. In fact I am pretty sure this restaurant will be a location of choice for a few marriage proposals in the toon this year. 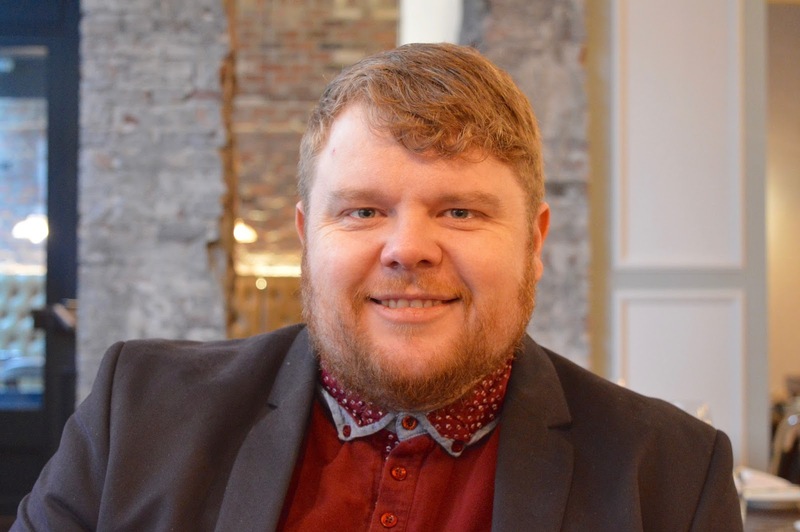 I wouldn't really choose to bring the kids here - it feels far too grown up for that and there are so many other places in Newcastle that are better suited. Steve and I said the next time we return will probably be to try their early evening special followed by drinks on the Quayside. Sign up to the Dobson & Parnell Food Club via their website to hear of future offers. Disclosure | We were provided with a complimentary meal in return for an honest review. It was! I would never be able to recreate it at home so it felt like a real treat. Gosh Sam I don't say this lightly but that really was a superb review. In just the year I've been following you, your reviews have gotten so much better. I really have a clear image of the place in my minds eye now and what it would be good for. Your photos are fantastic too. Real pro-blogger quality here. You are a real inspiration to me Mammy-mentor! I can't wait to try this place out. It's next on my list for when we get a babysitter. I might consider it for Valentine's actually. Ah thank you Nyomi - it's really lovely for you to say. I think you and Mark will love it! They aren't charging any more or creating a specific menu for Valentine's which I love! I've read a few reviews of this place, but this one has given me the clearest impression of the food, ambience and service. I'm a big fan of their other restaurants so will have to check this one out. If you like Hinnies and Blackfriars you'll definitely enjoy Dobson & Parnell - I think it might be my favourite of the three. It puts the cheese sandwich I am having for lunch today to shame! Looks and sounds like my type of place! Might have to treat my mum for her birthday soon. Just one question - did you find the portions big enough? Yeah we did - we had 3 courses but there was bread too. You can order additional sides for £3/£4 I think. We didn't feel this was necessary with having 3 courses and left feeling satisfied.